Click on thumbnail images to see larger version. Light rings around the moon [Lunar Rings] are an interesting phenomena. 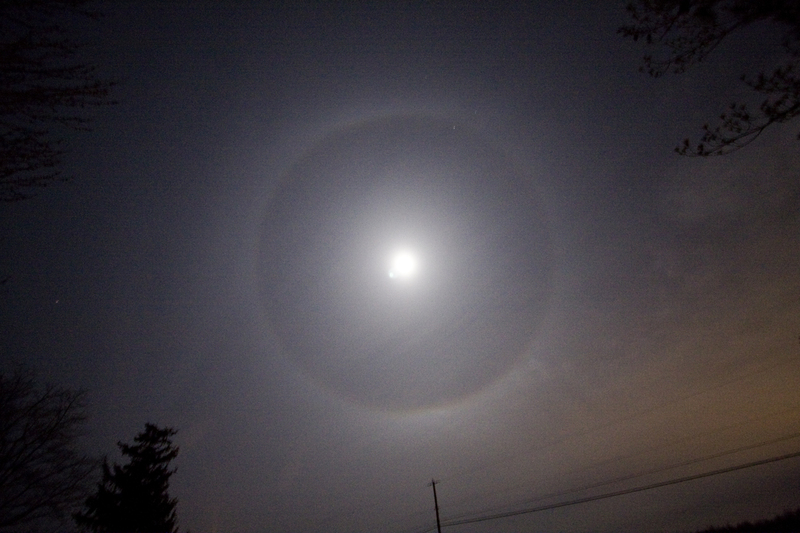 The occur when high altitude ice crystals intercept light from the moon and bends its path to earth. The result is a concentric ring of light 11o away from the center of the moon. 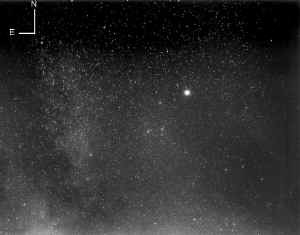 This image was taken on March 8, 2008. The sky had been quite clear until about midnight. The a cold front came in and brought a small snow squall. The rings appeared just before it started to snow. There is an interesting explanation of the Lunar Ring process at: Moon Light Effects. This image was taken using a Cannon 40D camera and a 10mm lens at f/3.5. It is a one second exposure, had held. The image was taken in RAW and processed using PhotoShop CS3. This is a 30 sec time exposure taken with a Canon Rebel XTi digital camera. The photo was taken from our back yard pointing west about 2 hours after sunset. The observatory dome can be seen in the right side of the image. Does this qualify as Astrophotography? 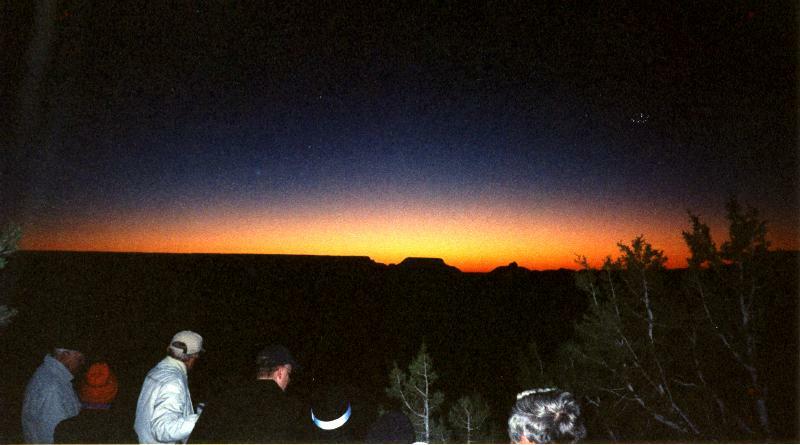 This is Easter sunrise at the Grand Canyon, 2003. The local churches get together and put on an outstanding musical program for the Easter sunrise service on the south rim of the Grand Canyon. The experience is worth the trip! We took a trip to Arizona in 2003 to attend the spring meeting of the AAVSO in Tucson. Our trip included a stop-over at Flagstaff. 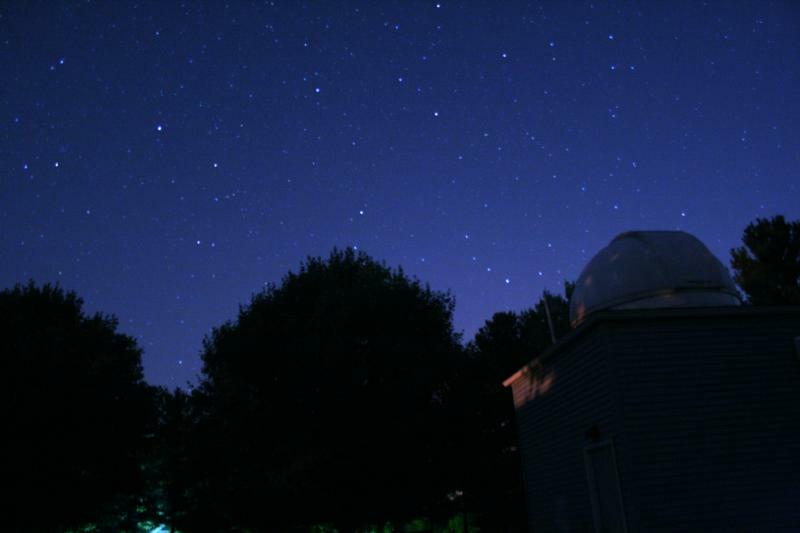 The entertainment one evening was the opportunity to view Jupiter and Saturn through the 24" Alvan Clark refractor telescope at the Lowell Observatory. This scope is still quite functional and, although not of the same quality as some of the more recent scopes, it was a thrill to look through it. One of the great historical photos of astronomy is of Percival Lowell looking through this 24" scope. I like how he had is sports cap on backwards. I couldn't resist having a similar picture taken of myself when I had a chance to use this fine old instrument. This image was made with a Graflex Crown Graphics 4"x5" sheet film camera, circ 1950. The film that I use most commonly is Kodak 4415 Tech Pan which has been 'hypered' in an 8% hydrogen gas for about 24 hours at 50oC. The hypering process makes the film react in a more linear fashion to long exposure periods [overcomes reciprocity failure]. 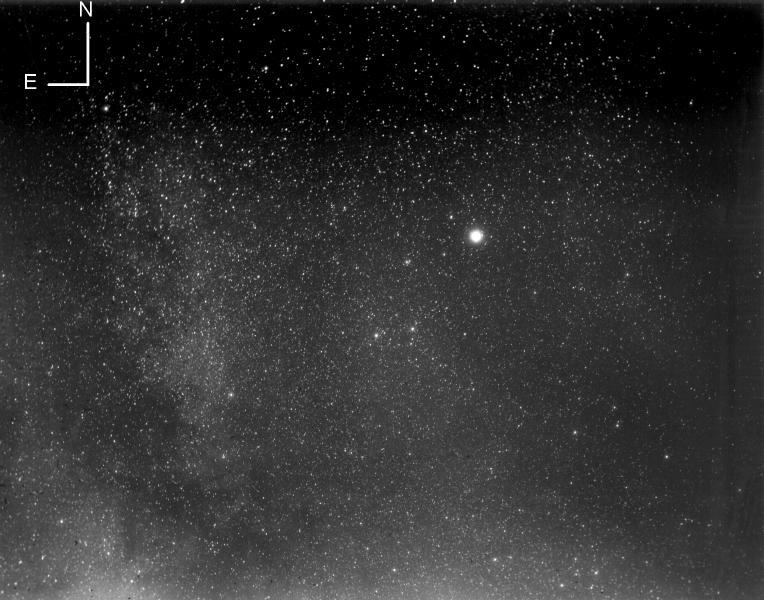 This film image was taken at my home observatory and is centered on the constellation Lyra. The image size is approx. 1503 x 1878 arc sec. The bright star is Vega. The diamond shaped asterism is visible and , in the larger image, the Ring Nebula, M57, can also be located. That cloudiness on the left half of the image is the edge of the Milky Way. The film is 4415 Tech Pan hypered for 24 hours at 50oC. Exposure time is 30 minutes at f/4.5, 145 mm lens. The film was processed for 10 minutes in D-19. This double rainbow is a composite of four digital images taken with a Sony Mavica digital camera. We had experienced a day of drizzle in August of 2001 following a period of about 3 weeks of draught. The color enhancements make the image somewhat surreal.